The Cook and the Gardener: A Year of Recipes and Writings from the French Countryside by Amanda Hesser is part memoir, part cookbook. The book is designed around the seasons, beginning in January and going through to December. 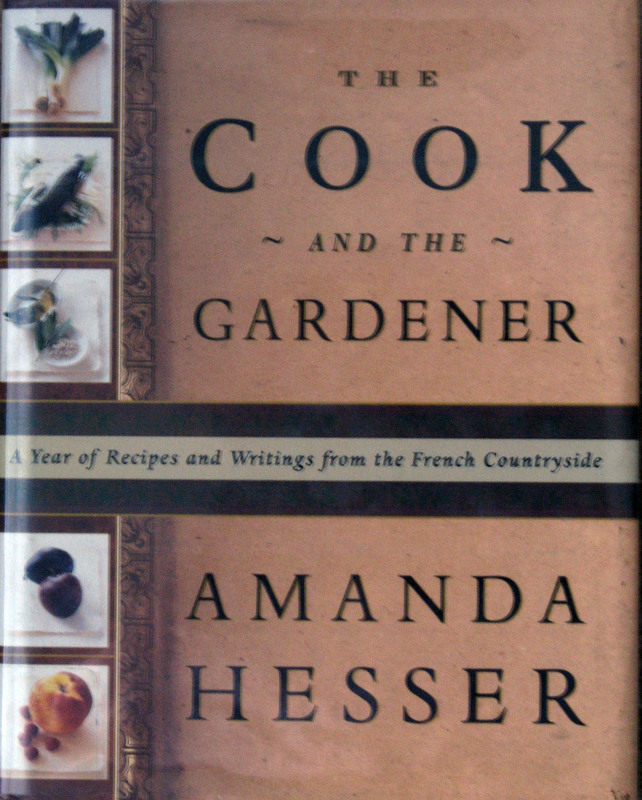 Hesser tells the story of her life in a chateau kitchen in Burgundy and how it intertwines with the chateau's garden and its keeper, the elderly Monsieur Milbert. Each month of the year receives its own chapter with a description of what is going on in the garden at that time of year and what gets cooked in the kitchen. The rest of the chapter is devoted to seasonal recipes using the garden produce. If you are an avid gardener, or, are seriously interested in eating seasonally, you will enjoy this book. I did find that many of the recipes seemed very "French" (of course this is a book about living in France!) and thus perhaps too involved, or too "out there" for my taste. But, the book as a whole is very inspiring, and filled with ideas on what to grow, how to grow it, and how to cook with it. The author gives very clear, detailed instructions, so you are sure to be able to make the recipes she gives you. I tried two recipes from this book: a soup and a salad. Both turned out very well. 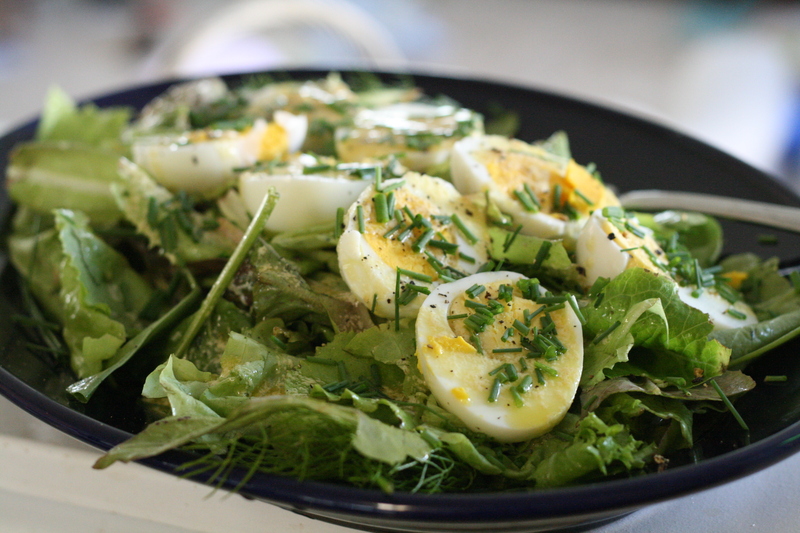 I loved the presentation of the egg salad and found that I could make the salad with whatever greens and herbs I had around, improvising on the recipe while keeping to the main idea. And the soup was delicious! I was skeptical at first, but upon tasting it felt like it was worthy of a fancy restaurant. I'll be making it again, and perhaps taking up the author's idea of freezing it in large batches when zucchini is abundant. Hard boil the eggs: bring a large pot filled with water to a boil. Add the eggs and cook for 11 minutes. Plunge the eggs in cold water and peel them. Sometimes it helps to run them under cold water as you peel them. The water runs between the thin skin that covers the egg and loosens it, making peeling much easier. Use a thin knife to cut them in half lengthwise. In a small bowl whisk 2 Tbsp. of the olive oil, the mustard, and cream until well emulsified and smooth. Dress the greens: In a large mixing bowl, combine the greens, season with salt, and pour over the remaining tablespoon of olive oil. Toss well to coat all the greens. Pile the greens on a large round plate. Set the egg halves on the greens in the center of the plate. Season them with salt and drizzle on the mustard dressing. Generously sprinkle the herbs over them and then some pepper. Serve immediately. If the eggs are slightly warm, all the better. Peel and seed the zucchini: zucchini rarely needs much prepping, but for this dish you want a light-colored, smooth soup, so some work is required. Begin by cutting off the stem and flower ends close to the zucchini flesh. Then use a vegetable peeler to peel the skin from the zucchini. (If it bothers you to waste this, you may include it; or reserve it and saute the strips of skin in olive oil for another meal.) Cut the zucchini lengthwise in half, then in quarters. If the zucchini are older and the seeds are large, you will want to remove them by laying each quarter on its side and cutting along where the seeds and flesh meet. Discard the seeds. 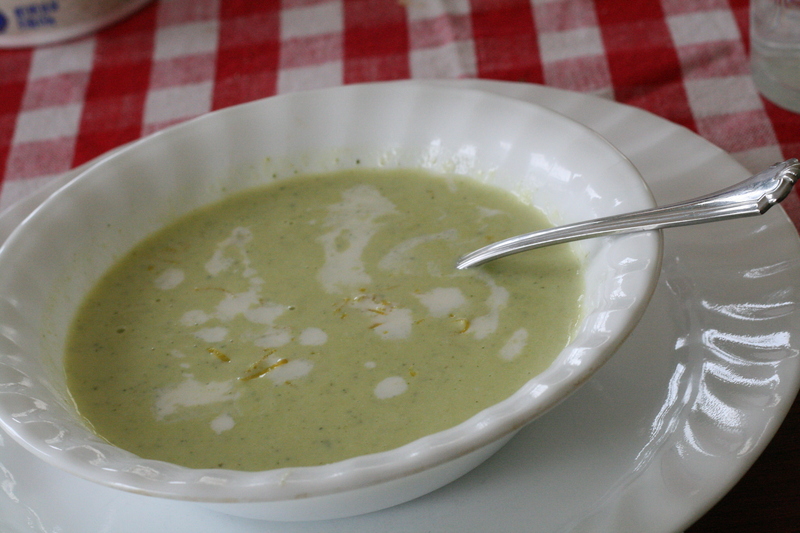 If the zucchini are very young, the seeds are usually insignificant and can remain a part of the soup. Now cut the quarters crosswise into even-sized cubes (about 1 inch). In a large saute pan, warm the olive oil with half of the grated lemon zest, all of the zucchini, and the garlic, shallot, and white wine. Season lightly with salt, and lay a piece of parchment paper or a lid over the mixture to cover. Sweat over medium-low heat, stirring from time to time, for 20-30 minutes, until the zucchini is soft all the way through and there are just a few tablespoons of liquid remaining in the pan. You may have to do this in two batches if you do not have a very large pan. If so, omit the garlic and shallots from the second batch. Heat through, adjust the seasoning, and ladle into four individual bowls. Serve warm or cool, drizzling with olive oil (or cream) and sprinkling some of the remaining grated lemon zest on top of each serving just before going to the table. I would love to be a gardener but as of yet all I seem to be able to do are herbs in a sort of raised garden. This egg salad really does look delicious. Yesterday evening we ate a beautiful summery meal out on the terrace with friends. It was one of those rare evenings where the sun actually shone warmly. I'm still getting used to being up at 10 p.m. and it's still light!! So different from Uganda where night falls at 7 o'clock on the dot.. Anyway the menu was a huge fresh salad of a crunchy assortment of different salad leaves, vivid red and yellow peppers, gorgeous cherry tomatoes, sliced English cucumbers and a generous sprinkling of sesame seeds, dried herbs and fresh herbs from our friend's herb garden outside. Lovely!! And I didn't have to wash the lettuce or tear it up or do pretty much anything. The joys of Europe!! To go with that, we had freshly baked rolls (not homemade though!! You just buy a packet and stick them in the oven) and my secret recipe of macaroni cheese with ready-grated cheese and chopped ham as well as a cream sauce. The dessert was the real crowning glory of the meal though. A lovely crisp tart base (thanks, Jamie Oliver!!) was topped with plenty of whipped cream (piped out of a bottle!! No whipping, beating, etc. Yah!!) and all those glorious fresh berries I was talking about!! :-D Strawberries, blackberries & WHIPPED CREAM!! Bliss.. Apparently this is what the esteemed Willis was takiln' 'bout.